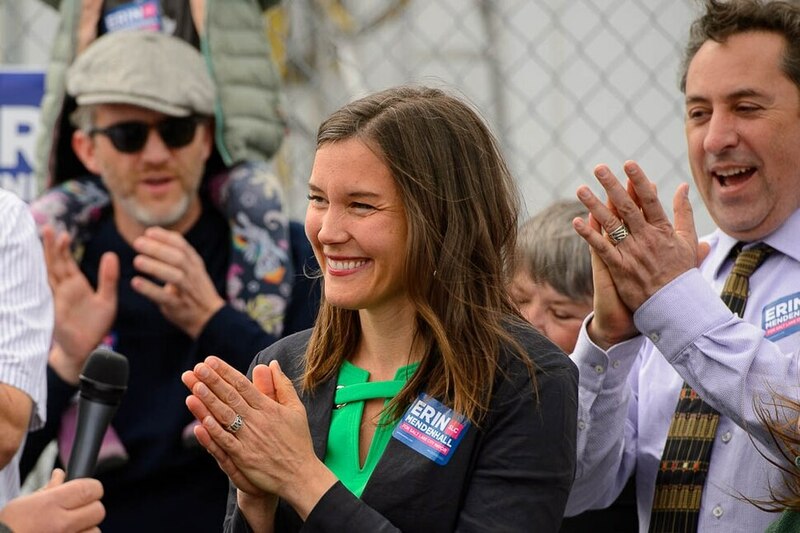 (Trent Nelson | The Salt Lake Tribune) Salt Lake City Councilwoman Erin Mendenhall launches her campaign for mayor on Sunday April 14, 2019. She enters the race with six years of council experience serving the city’s Ballpark, Central City, Central 9th, East Liberty Park, Liberty Wells and Wasatch Hollow communities. She has a background in the nonprofit sector, working previously with the clean-air advocacy group Breathe Utah as its policy director and interim executive director. 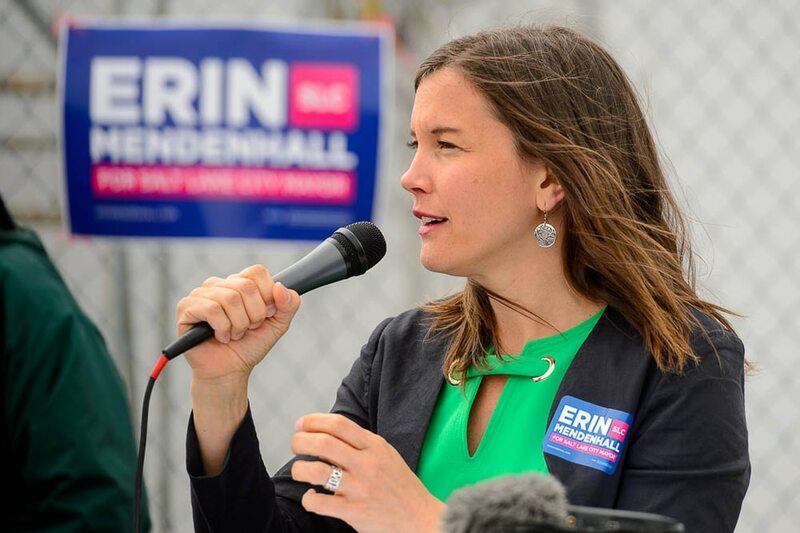 (Trent Nelson | The Salt Lake Tribune) Salt Lake City Councilwoman Erin Mendenhall launches her campaign for mayor on Sunday April 14, 2019. She enters the race with six years of council experience serving the city’s Ballpark, Central City, Central 9th, East Liberty Park, Liberty Wells and Wasatch Hollow communities. She has a background in the nonprofit sector, working previously with the clean-air advocacy group Breathe Utah as its policy director and interim executive director. (Trent Nelson | The Salt Lake Tribune) Salt Lake City Councilwoman Erin Mendenhall launches her campaign for mayor on Sunday April 14, 2019. She enters the race with six years of council experience serving the city’s Ballpark, Central City, Central 9th, East Liberty Park, Liberty Wells and Wasatch Hollow communities. She has a background in the nonprofit sector, working previously with the clean-air advocacy group Breathe Utah as its policy director and interim executive director. (Trent Nelson | The Salt Lake Tribune) Salt Lake City Councilwoman Erin Mendenhall launches her campaign for mayor on Sunday April 14, 2019. She enters the race with six years of council experience serving the city’s Ballpark, Central City, Central 9th, East Liberty Park, Liberty Wells and Wasatch Hollow communities. She has a background in the nonprofit sector, working previously with the clean-air advocacy group Breathe Utah as its policy director and interim executive director. 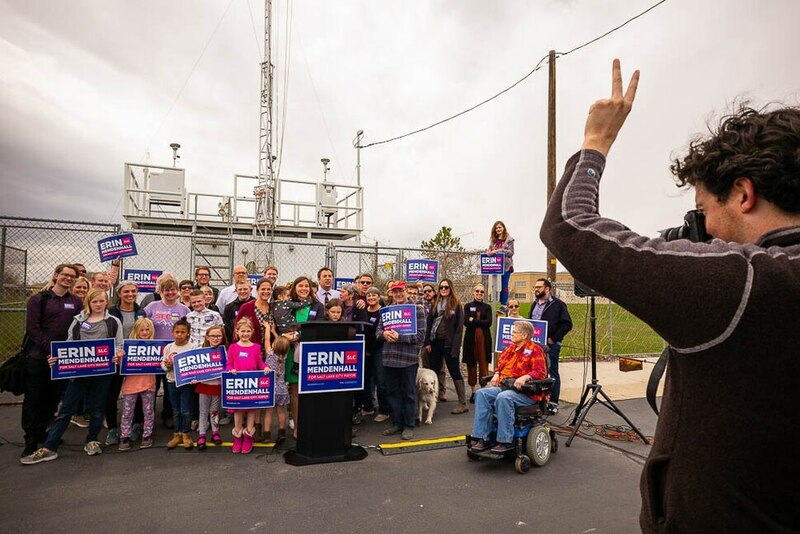 (Trent Nelson | The Salt Lake Tribune) Salt Lake City Councilwoman Erin Mendenhall launches her campaign for mayor on Sunday April 14, 2019. She enters the race with six years of council experience serving the city’s Ballpark, Central City, Central 9th, East Liberty Park, Liberty Wells and Wasatch Hollow communities. She has a background in the nonprofit sector, working previously with the clean-air advocacy group Breathe Utah as its policy director and interim executive director. For the first time, she began to doubt the choice to raise her family here, in a state that has struggled to meet federal limits for ozone (an airborne pollutant that is particularly harmful to children) and in a city that is frequently shrouded by inversion. That was 13 years ago. Since then, Mendenhall has moved from “activist to advocate to leader” — working with Utah Moms for Clean Air, helping co-found the clean-air advocacy organization Breathe Utah and now serving on the City Council. And on Sunday, she officially launched her campaign for Salt Lake City mayor in front of friends, family, supporters and an air quality monitor in Rose Park at the Salt Lake Center for Science Education, where she promised to keep air quality work a focus. Mendenhall, who serves as chairwoman of the state Air Quality Board, previously told The Salt Lake Tribune that she would work as mayor to expedite the city’s plan to become 100 percent powered by renewable energy by 2030 instead of the original goal of 2032. She also said she would work to increase transportation options across the city to get people out of their cars. But as Mendenhall looked to a future Salt Lake City on Sunday that she said she would lead to “cleaner air, stronger neighborhoods and smarter growth,” she also looked to the past, lauding her accomplishments during her six years serving on the council. She pointed to her role in cobbling together the $21 million the city’s redevelopment agency put toward affordable housing two years ago, her work to establish better bus service for Salt Lake City residents and her support for fixing Salt Lake City’s streets with an $87 million bond that was approved by voters last fall. While there’s a long list of candidates vying for the mayoral seat, Mendenhall is one of two with City Council experience. Her former colleague Stan Penfold, who announced his campaign in October, served two full terms on the council before leaving office in early 2018. Two years ago, Rob Miller’s campaign for Utah Democratic Party chairman was derailed by allegations of sexual misconduct. Now, he wants to run again. Salt Lake City Councilman Chris Wharton, who noted that he came to the launch as a friend and has not yet endorsed any candidate in the crowded mayoral race, said he’s been impressed during their time working together by Mendenhall’s leadership skills and her ability to build consensus among council members. Mendenhall — who serves the Ballpark, Central City, Central 9th, East Liberty Park, Liberty Wells and Wasatch Hollow communities — still has two years left in her second term representing the city’s District 5 and would retain her seat if she lost her bid for mayor. Other contenders for the mayor’s seat include former state Sen. Jim Dabakis; state Sen. Luz Escamilla; David Garbett, the former executive director of the Pioneer Park Coalition; former Downtown Community Council Chairman Christian Harrison; and Latino businessman David Ibarra. Richard Goldberger, a freelance journalist; Aaron Johnson, a military veteran and novice politician; and Carol Rogozinski, who ran previously for City Council District 5, have formed personal campaign committees to run in the race.